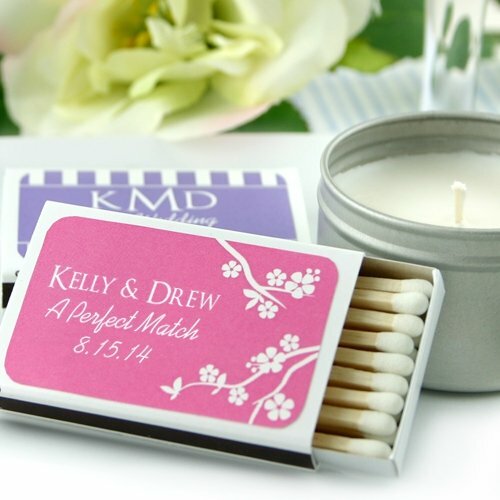 Light the way to an amazing day with our elegantly designed Personalized Matchbox Wedding Favors! You could also add a small candle to complete a gift your guests will love. Choose from a variety of stylish Silhouette designs to match your theme. We then personalize the matchbox labels with 3 lines of text to make them uniquely you. Boxes measure 2.25" x 1.375"
NOTE: The matchboxes themselves are not imprinted. Easy assembly with self-adhesive personalized labels. I am trying to order 260 match boxes to use as part of a wedding favor. I need to know how to write the names and their wedding date as well as the color of the boxes and the color of the print. Sure thing. You’ll be able to make those selections during the checkout process. Just add the Personalized Matchbox Wedding Favors to your cart and you’ll see all the options. You’ll also see the options on that page. What type of fonts do you offer for the personalized match boxes? We wanted to do something simple like just the letter of our last name but we wanted a cursive font. Towards the bottom of the description, there's a link to click on that says Label Design (View Designs). This will show you the font used for each design. Only the design options listed on our site are available. I'm sorry, we're not able to accept other font styles or images. Also, the designs are pre-printed, so we're not able to remove them / change the templates. I was interested in the personalized match boxes and I just have a few questions. How many matches come in the box? Each of the Personalized Matchbox Wedding Favors (Set of 50) contains between 22 to 24 wooden match sticks with white tips. The boxes measure 2.25" x 1.375". Also, the matchboxes themselves do not come imprinted but it's easy assembly with self-adhesive personalized labels.